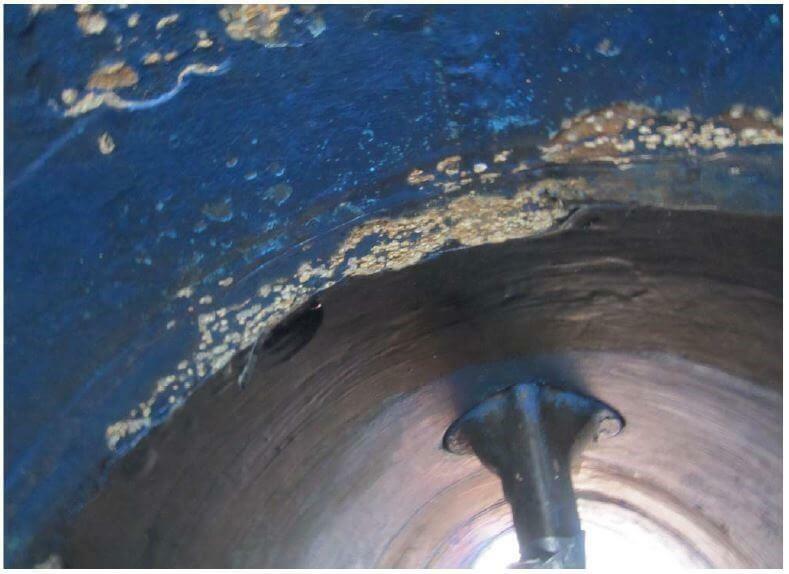 Takeaway: Part 3 of this series examines the performance of a new elastomer coating technology in three field studies spanning two decades, shown in photos and inspection results. Gavin Bowers, CEng is affiliated with Belzona Inc. and can be contacted using the options on the right. For info on how we work with industry partners click here. Parts 1 and 2 of this series examined the cavitation process and a novel approach to preventing it with the use of an innovative, high-performance coating. The new technology can best be described as a polyurethane or as an elastomer specifically designed for coating extremely localized high-pressure areas where abrasion, cavitation, erosion and corrosion resistance are required. We will now look at case studies to examine this new protection technology in action. 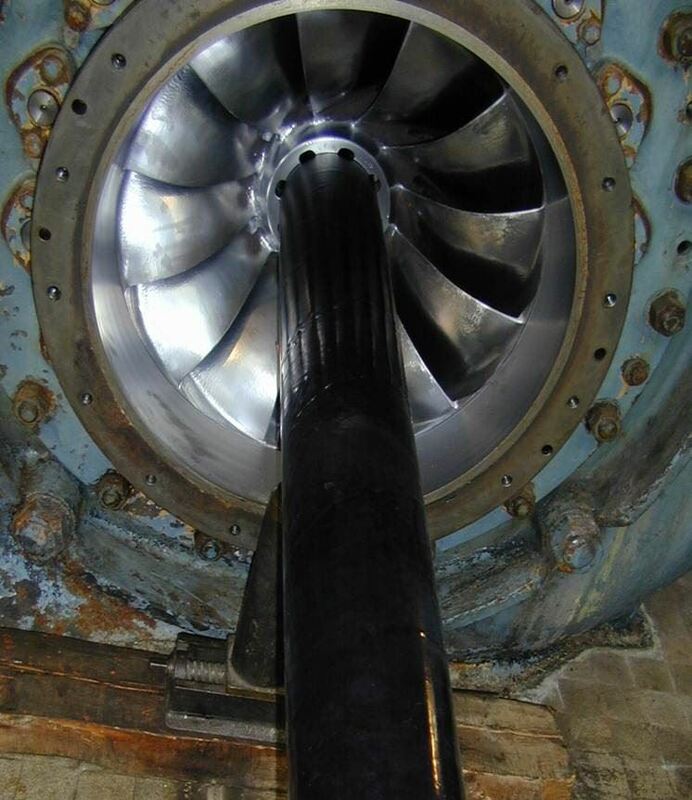 A hydroelectric plant in Ontario, Canada was faced with a cavitation problem. Twin 36'' (914mm) cast iron Francis turbine runners, constructed in 1945 and operating with a 42 feet (13m) head, had suffered erosion leading to the loss of performance. 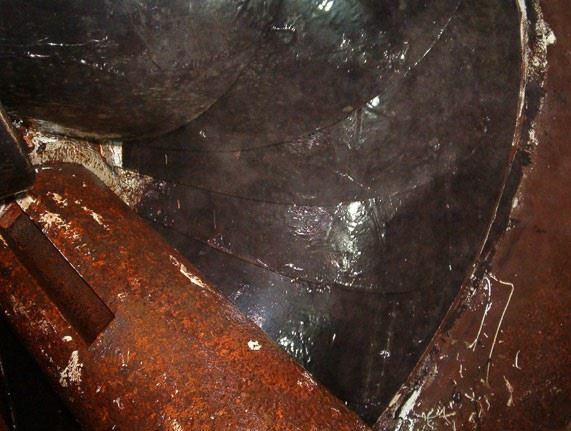 Both semi-rigid and flexible epoxy coatings had been applied in 1998 to combat cavitation, but these coatings had eroded after three years in this aggressive environment. Figures 1, 2 and 3 serve as good training material, as they clearly show the damage occurring in areas of pressure change, where low pressure generated cavitation bubbles, reaching the higher pressure areas and imploding. The problem was consistent on each channel. 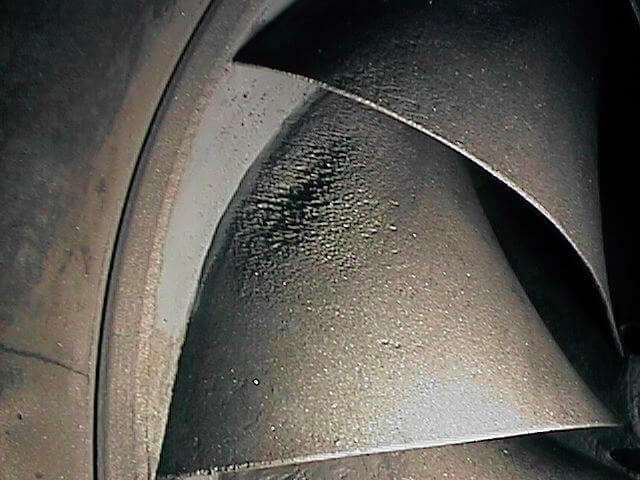 Figure 1: Francis turbine showing existing cavitation damage in LP area. Figure 2: Semi-rigid epoxy at 36 months, erosion damage. Figure 3: Flexible epoxy 36 months in service showing delamination. Figure 4: Elastomer coating after 34 months in service without damage. The fluid elastomeric coating was installed in 2002 and later inspected that same year with no damage noted. Subsequent inspection after an additional 34 months in service (Fig. 4) showed no sign of damage to the coating. 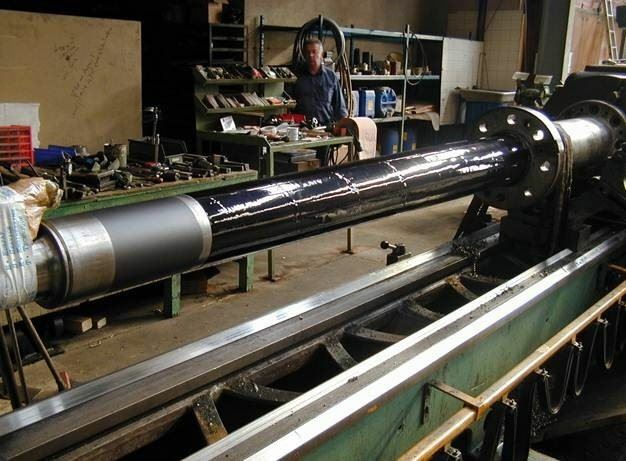 The main 6.29'' (160 mm) diameter shaft, running at 1000 rpm at a hydropower station in France, was damaged by cavitation and erosion (Fig. 5). A system comprising a two-part hydrophobic epoxy and an elastomeric top coating was applied in 2006 to repair the defective area and prevent further damage (Fig. 6). 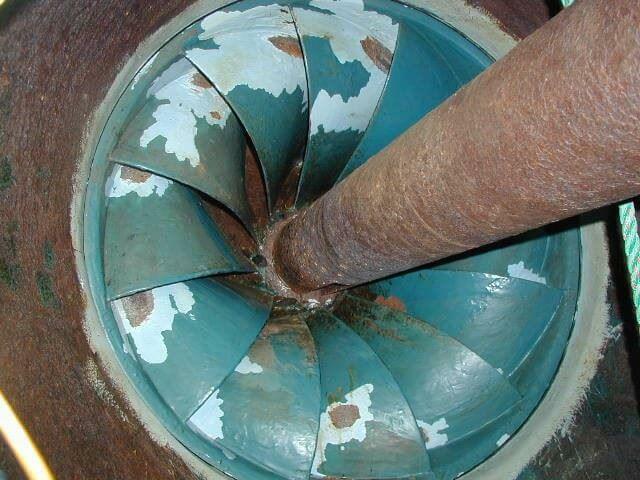 Figure 5: Cavitation damage to the shaft. Figure 6: Shaft repaired and protected. Figure 7: Inspection after 9 months in service. Inspection of the shaft in 2007 (Fig. 7) and in 2010 showed the system still in perfect condition. 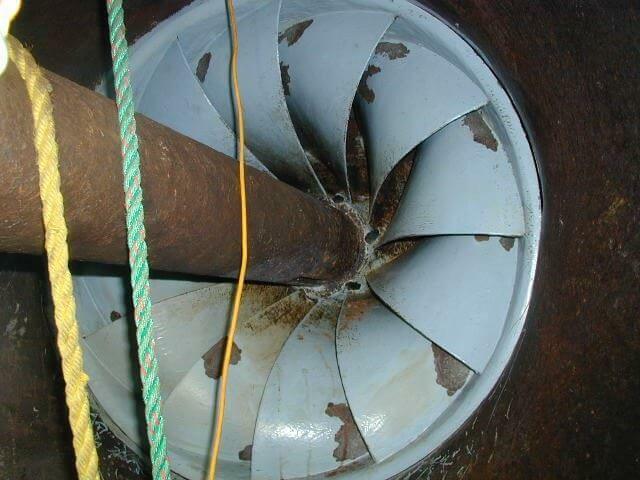 The port bow thruster tunnel of a Fast Ferry built in 1997 suffered extensive cavitation damage. Previous attempts with both glass flake and semi-rigid epoxy coatings lasted less than 12 months before repair was necessary (Fig. 9 and 10). The problem was particularly unusual as it only affected only one of two identical bow thruster tunnels on the port side (whereon the vessel ties to the quay), despite the fact that both tunnels were used equally, and were of identical design. Figure 9: Damage to glass flake coating. 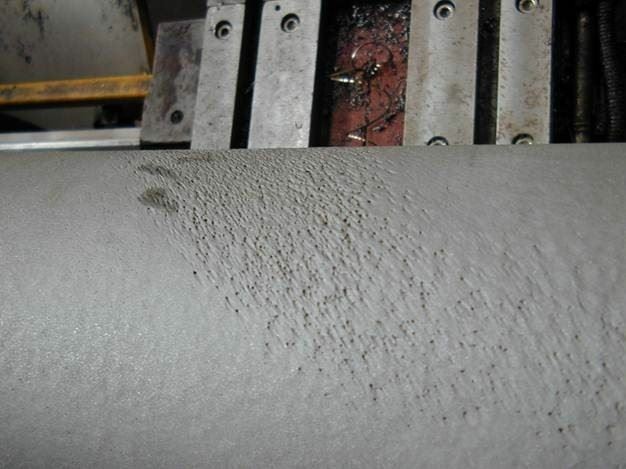 Figure 10: Damage to semi-rigid epoxy coating. In 2002, the fluid elastomeric coating was installed. 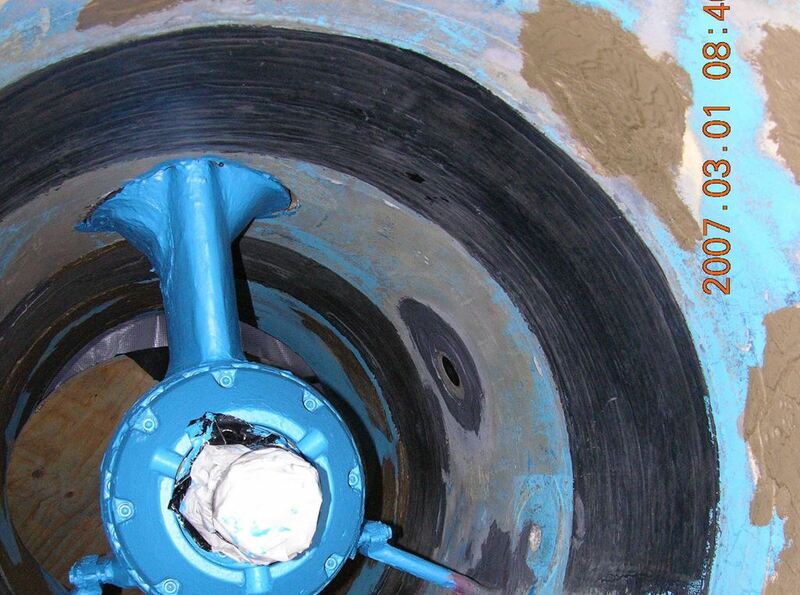 To repair heavy pitting and provide a smooth surface, an epoxy-based composite material was utilized. 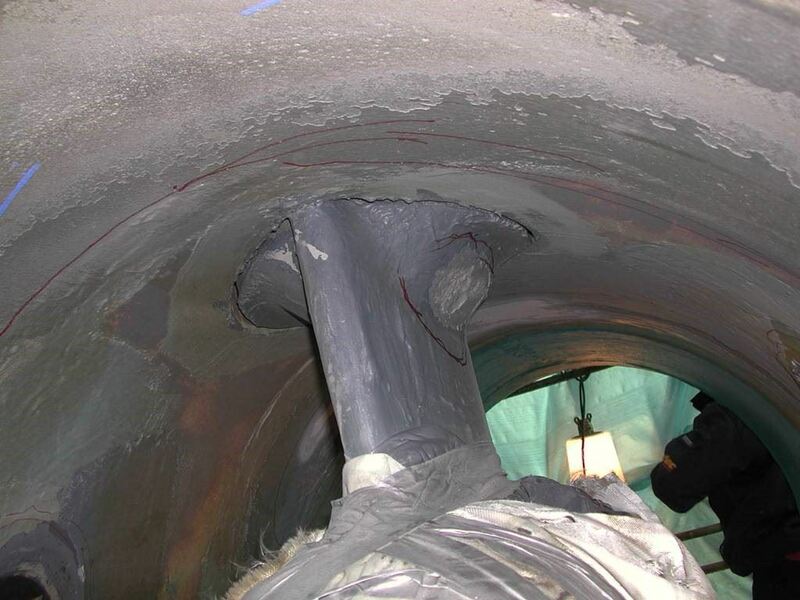 Initial inspection after one year showed localized wear in the top of the tunnel only, where a coating application error resulted in insufficient thickness. Otherwise, the elastomer provided a significant improvement over all previous attempts to protect this tunnel. Application of a further coat of elastomer resulted in two additional years of service without the need for repair, allowing the owner to extend periodic dock maintenance from annual to every two years. This case also provided a learning experience. It was believed that the impressed current cathodic protection systems of both the catamaran and the quay may have been interacting with each other, together with the cavitation, to cause conventional coating/lining systems to degrade prematurely. In this instance, the two-part epoxy base coat provides excellent corrosion and cathodic disbondment protection, while the elastomeric coating offers cavitation resistance. Applied together as a system, both coatings ensure excellent in-service performance. Figure 11: An elastomer coating system was applied in 2002. Figures 12, 13 and 14 demonstrate the elastomeric coating’s performance in service, with the latter two photos showing inspection after seven years in service. Figure 12: Inspection after 5 years in service. 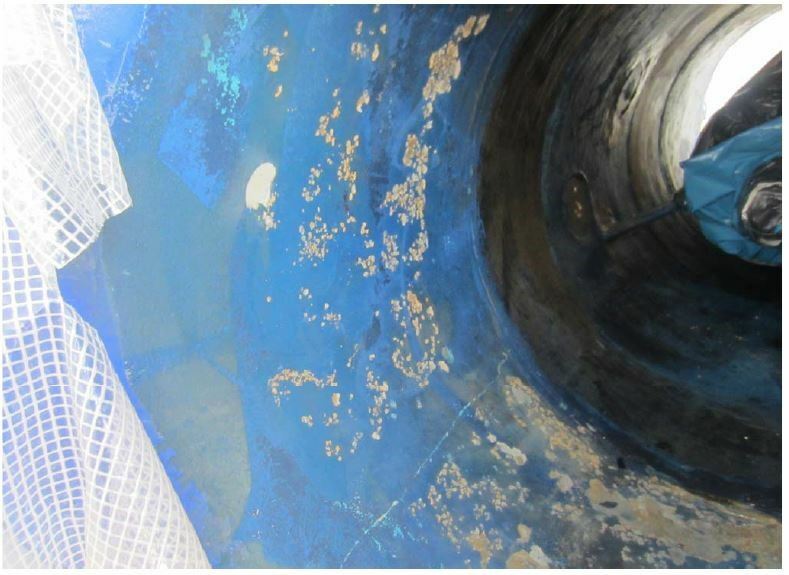 Figure 13: Inspection after 7 years in service shows deterioration of anti-fouling paint. Figure 14: Inspection after 7 years in service illustrates the need for periodic inspections. 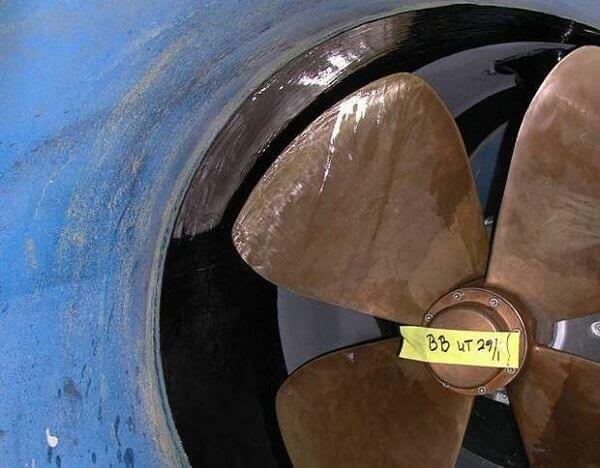 Figure 13 particularly demonstrates the beginning of deterioration of the conventional marine anti-fouling paint. In this case, the breakdown of the paint had led to undermining the main system, the solution being to extend the elastomer system. The latter example demonstrates the need to maintain the inspection of coatings. Coatings are a tool for the designer/operator to provide an optimum blend of performance and cost efficiency. However, coatings can be damaged through misapplication, changes in operating conditions or mechanical forces. 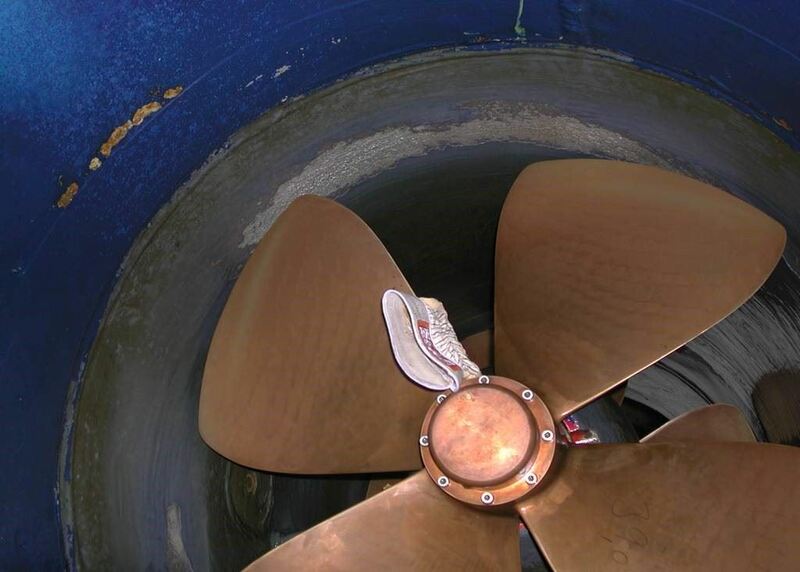 Periodic inspections afford the operator the opportunity to take corrective action. When we add the potential corrosion forces present when metals are used, we realize that the polymer choices for protection are very limited. Research and development has shown that there is a consideration of the use of epoxy and elastomer technology, which can address these issues and offer the asset owner reassurance with respect to the operation of fluid flow equipment. Gavin Bowers started his professional career in ship maintenance, repair and conversion, where the effects of erosion and corrosion are severe and require managed attention to prevent premature failure. In 1999, he joined Belzona Polymerics in their technical department, becoming involved in product development, technical support, and fault analysis/rectification. Bowers has also developed validated training courses that lead the field in defining new standards of competence for those in the coating and composite repair industries. A Chartered Engineer and NACE Coating Inspector, CIP Level 3, Bowers is currently the Operations Manager at Belzona Polymerics, overseeing coatings manufacture, dispatch and facilities management.